What sort of person breaks into Auschwitz? An author — and semi-reformed punk rocker, recovering academic and occasional criminal lawyer — in search of answers. Bram Presser joins the show to talk about his award-winning, fantastic debut novel The Book of Dirt , a memoir-fiction hybrid about his family’s experience in the Shoah. We get into the myths of how his grandfather survived the concentration camps and what they meant for his family and his book, the years of detective work (and the lucky breaks) researching his grandparents’ stories and records and the limits of knowing anyone else’s life, the exceptionalist vibe of Czech Jews, the stories he was afraid to learn and the heroism that redeemed his great-grandmother and her family, the challenges of researching an unheard-of story of survival when archivists are already put off by your punk-rock appearance, and how Bram avoided Holocaust cliches while giving agency, dignity and social dynamics to the prisoners in the camps. 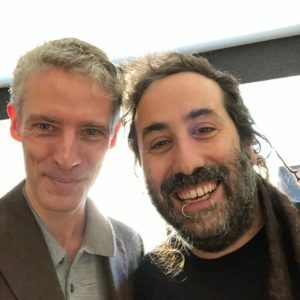 We also get into Bram’s worries about feedback from his mentor Dasa Drndic, the value of documentary fiction, the aspects of his other careers that supported his ability to write The Book of Dirt , that Auschwitz break-in, and why Talmudkommando would have been a better name for his Jewish punk band than Yidcore. Give it a listen! 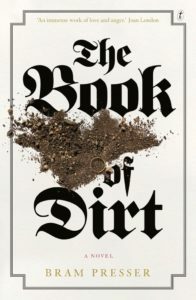 And go buy The Book of Dirt ! Scruffy scrivener. Semi-reformed punk rocker. Recovering academic. Occasional criminal lawyer. Two-time cartoon character. After schlepping around the world for 10 years in the acclaimed punk band Yidcore, Bram Presser realized he was getting too old to sleep on concrete floors and smear hummus over himself every night. Swapping the rubber chicken for a fountain pen, he has since dedicated himself to writing. In 2011, Bram won The Age Short Story Award and since then his stories have appeared in Best Australian Stories, Award-Winning Australian Writing, The Sleepers Almanac, and Higher Arc. 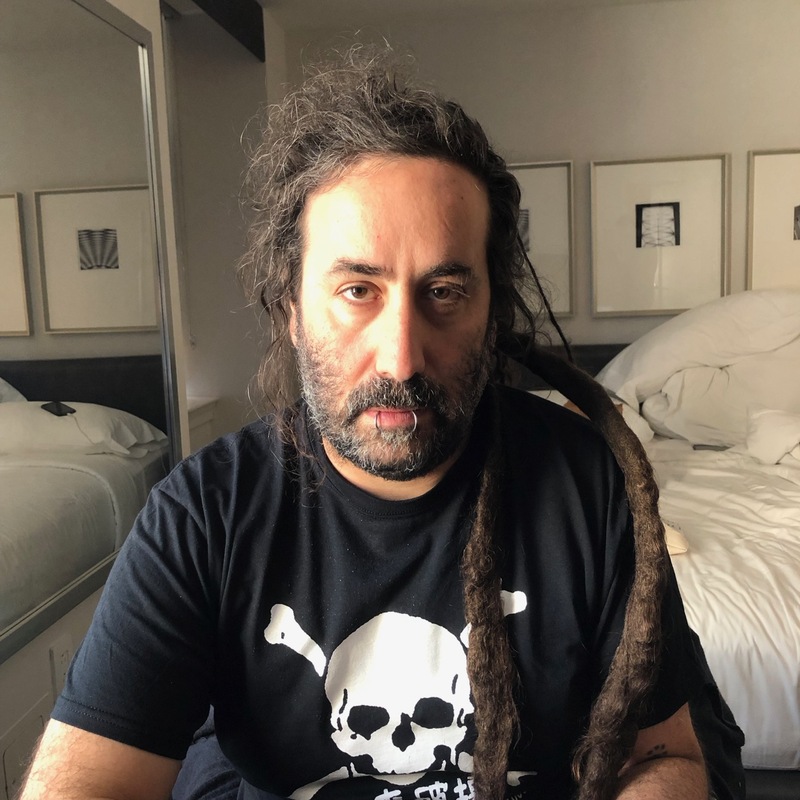 His debut novel, The Book of Dirt , was published in Australia in 2017 by Text Publishing to wide acclaim and went on to the New South Wales Premier’s Literary Award for Fiction, Best New Writer and People’s Choice Awards in 2018, as well as the prestigious Voss Literary Prize. The novel was published in the U.S. in 2018 and recently won the Goldberg Prize for Debut Fiction at the National Jewish Book Awards. Credits: This episode’s music is Fella by Hal Mayforth, used with permission from the artist. The conversation was recorded at AKA Central Park on a pair of Blue enCORE 200 Microphones feeding into a Zoom H5 digital recorder. I recorded the intro and outro on a Heil PR-40 Dynamic Studio Recording Microphone feeding into a Cloudlifter CL-1 and a Mackie Onyx Blackjack 2×2 USB Recording Interface . All processing and editing done in Adobe Audition CC . Photo of Mr. Presser by me. It’s on my instagram.